PUBG (PlayerUnknown’s Battlegrounds), an online multiplayer battle game, has become very popular in recent years. PUBG Mobile is the mobile version of this game, and it has different versions in different languages. Recently many PUBG Mobile players want to know how to download and play the Chinese version of PUBG Mobile. Why People Outside of China Want to Play PUBG Mobile’s Chinese Version? Well, that’s because usually news features are released earlier to the Chinese version of PUBG Mobile than other languages such as English. Also, you might even find some special mode in PUBG Mobile’s Chinese version that don’t exist in other countries. Many PUBG Mobile players outside of China want to try exciting new game updates earlier or want to play exclusive game modes such as the Dragon Mode, or to be able to get hands on rare, exclusive weapons such as the Skorpion, so they want to play the Chinese version of PUBG Mobile. Is It Possible to Play PUBG’s Chinese Version If You Are Not in China? Yes, that’s possible. In this article, you can get step-by-step instructions on how to download, install and play the Chinese version of PUBG Mobile for people outside of China on both the iOS (iPhone, iPad) and Android devices. What Do I Need to Play the Chinese Version of PUBG Mobile? First of all, you will need to download and install the Chinese version of PUBG Mobile on your devices. Also, to log in and play the Chinese version of PUBG Mobile that has just been installed, you will need to have some special Chinese social media accounts to log in. In particular, you might need a WeChat account to do so. WeChat is a popular Chinese messaging app very similar to Facebook Messenger and WhatsApp. Then, once you are able to log in and play the Chinese version of PUBG Mobile, since the interface is in the Chinese language, you might need to understand some basic Chinese characters to be able to make sense of the menus etc. But that’s not difficult, you can use some basic Chinese translation software or just guest based on your previous experiences with the game. Sooner or later you will be able to understand the Chinese characters without any trouble. For iOS devices (iPhone and iPad), you will need to download and install PUBG Mobile’s Chinese version from Apple’s App Store. 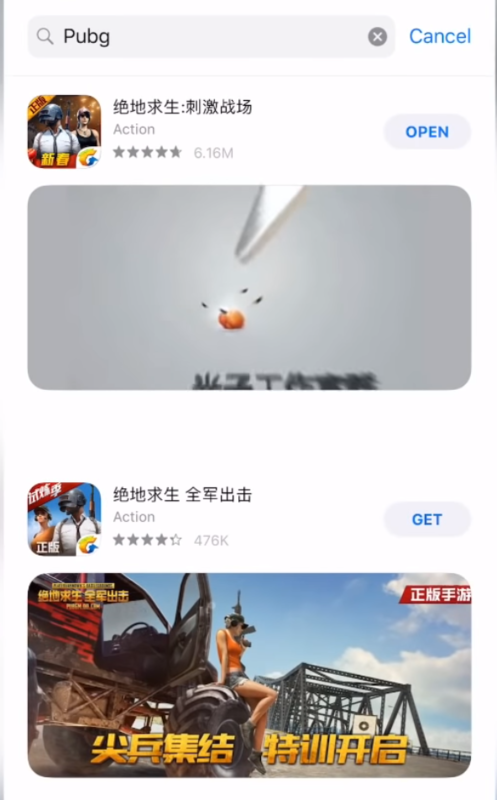 However, if you are not living in China, most likely your App Store account is not a Chinese app store account, and as a result, you won’t get the Chinese version of PUBG Mobile. To be able to get access to the Chinese version, you will need to have a Chinese app store account. I won’t go into too much details on how to register a Chinese app store account. But basically, you can register a Chinese account even if you’re not in China. Just select Mainland China as your account location when you register and then you will need to provide an address and phone number in China. Some people suggest you can get some fake Chinese address and phone number to do so. Also, you won’t need a Chinese credit card or other payment methods specific for China. Once you have a Chinese app store account, use it to log in your App Store on your iPhone or iPad and search for “PUBG” and you will be able to find a couple of Chinese versions of PUBG (“绝地求生” in Chinese characters) for you to download and install. The first time you open the PUBG mobile app (Chinese version), you will see some log in options. I suggest you choose WeChat (“微信”) log in. To do so, you will need to have a WeChat account. If you don’t have one already, just install the WeChat app (available from app store) and use your phone number to activate the account. Then you should be able to play the Chinese version of PUBG Mobile on your iPhone or iPad! 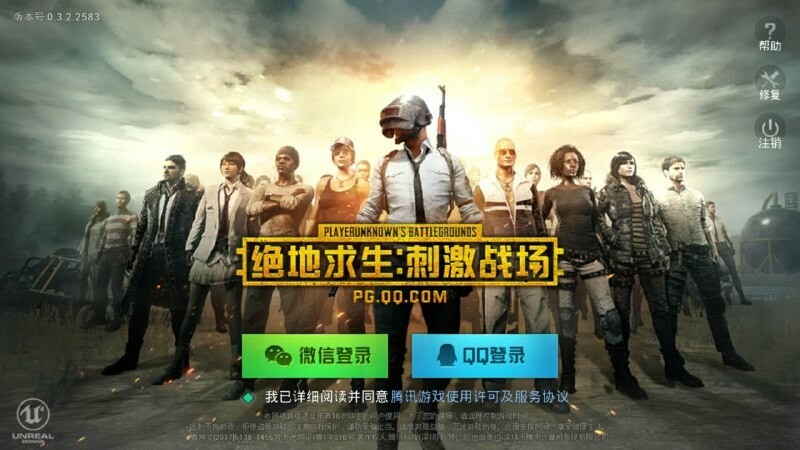 How to Download and Install the Chinese Version of PUBG Mobile on Android? For android devices, the process is a little bit different. In China, the Google Play Store is blocked and people in China use many different Chinese app stores to find and download Android apps. Some Chinese people use a VPN from China to access blocked contents but that’s a different story. Anyway, unless you have a Chinese app store installed on your android device, your option is to download the APK installation file for PUBG Mobile to install its Chinese version. To do so, visit this link from qq.com. You will then see a QR code on the page. Then you can scan the QR code with your android phone or android tablet to download the APK file for PUBG Mobile’s Chinese version and then click on the APK file to install. You might see some security warnings about installing apps from unknown sources, but we all know qq.com is the site of Tencent, one of the top IT companies in China, so it should be safe to do so. After you have installed PUBG Mobile’s Chinese version on your Android device, you can go ahead and open it. You will see some log in options on the first time you open it. I suggest you choose WeChat (“微信”) log in. To do so, you will need to have a WeChat account. If you don’t have one already, just install the WeChat app (available from your mobile app store) and use your phone number to activate the account. Then you should be able to log in using WeChat and start playing the Chinese version of PUBG on your android device! How to Bypass PUBG’s Region Lock? So far we have been focusing on how to download and play PUBG’s Chinese version for people who’re not living in China. However, there is a related question: how to bypass PUBG’s region lock? What Is PUBG’s Region Locking? When you are playing PUBG, the game knows which country and region you are playing from, based on the IP address of your computer or mobile phone. For reasons such as defeating hackers and cheaters, PUBG has implemented region locking to put on some limits and restrictions on players in certain countries. How to Bypass PUBG’s Region Locking? To bypass PUBG’s region locking, you have to hide your real IP address and pretend that you’re playing from another IP address, which belongs to a different country. The best tool to accomplish this is VPN. With a VPN account, you can connect to VPN servers in different countries before you start playing PUBG. For example, if you are in China and you want to pretend that you are playing from the United States, you can connect to your VPN’s U.S. server. As a result, you can bypass PUBG’s region locking for Chines players. What Are the Best VPNs for PUBG? When you choose a VPN for PUBG, you have to consider a number of things, such as: 1) Is the VPN speed fast enough and its ping time low enough for me to play the game? 2) Does this VPN have server locations that can help me to bypass PUBG’s region locking? PureVPN: PureVPN is a well-known VPN service that owns 2000+ world-wide servers covering more than 140 countries. PureVPN also has servers in China. So if you want to play PUBG’s Chinese version and avoid possible region locking for non-Chinese players, you can use PureVPN and connect to one of its servers in China. PureVPN also supports port forwarding (which is a great feature for gaming) and offers fast speed and low ping time. Its price is also at the low end and very affordable. ExpressVPN: ExpressVPN is one of the largest VPN services and it offers very fast and reliable VPN speed. ExpressVPN has servers in 160 locations and 94 countries. ExpressVPN works very well in countries where VPN traffic is heavily blocked. You can enjoy high-speed and low ping time on ExpressVPN’s servers. It offers a 30-day money back guarantee so that you can try it out for a month. NordVPN: NordVPN is also one of the most reputable VPN providers. It currently offers more than 5000+ servers in 62 countries. NordVPN’s speed and ping time are also very impressive and it’s a very good choice for online games such as PUBG. That’s it! I have covered how to install, download and play PUBG Mobile’s Chinese version for people outside of China. Hope it’s helpful and have fun playing the game!